Most afternoons at Northern Essex Community College’s Technology Center are quiet. But on one recent Thursday in Haverhill, delighted bursts could be heard from the large meeting room as more than 100 senior citizens sat watching YouTube videos of babies laughing. Mullen is a self-described gelotologist, a person who studies the health effects of laughter. His lecture was a part of the Life Long Learning program at Northern Essex. According to Mullen, laughter therapy can be used as an alternative to physical therapy and traditional medication, especially for those with chronic pain and other illnesses that appear as people age. “If you allow yourself to laugh, you can have a lot of fun and do some things that are healthy at the same time,’’ he said. Mullen, who is in his late 60s and previously worked in construction and real estate, said at about age 50 he decided to change careers. 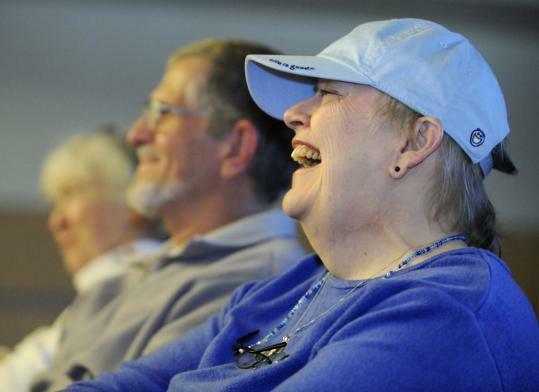 His reading and anecdotal research led him to create a presentation on the health effects and benefits of laughter, which he delivers at senior centers and colleges throughout the North region and southern New Hampshire. To warm up the audience, Mullen began his presentation at NECC by showing a slide show of comedians such as Jack Benny, Bob Hope, Lucille Ball, and George Carlin. To prove his point that laughter releases endorphins, chemicals in the brain that have pain-relieving qualities, Mullen showed the crowd videos of laughing babies and “talking’’ cats and dogs. After the laughter in the room died down, Mullen encouraged the audience to look at such videos every morning for 5 to 10 minutes. “I tell people if you’re not smiling and laughing when this comes on, you’re really a sociopath,’’ he joked. Asked why people sometimes scream when they laugh or cry, Mullen said those reactions, like laughter, are ways for people’s bodies to relieve stress. He repeatedly told the crowd not to take life, or themselves, so seriously. Lisa Wessan, a licensed clinical social worker, said she has a similar philosophy she teaches in her laugh therapy classes. Wessan runs Mirth Maven, a company that provides lectures and seminars on laugh therapy. She used to hold laughter therapy workshops in a New York hospital. People have a more positive outlook on life if they laugh often, she said. According to Wessan, other benefits of laughter are increased memory and information retention, and an increased metabolism. Mullen said he will discuss benefits like these and others, along with the science behind smiling and laughter, at NECC in September, when he will offer a three-part series on successive Tuesday mornings. Len Douglas of Haverhill, who attended Mullen’s first lecture, said he planned to sign up for the class as a way to keep his mood light.